This architectural jewel is in a key location, minutes away from Cancun&#039;s main attractions. 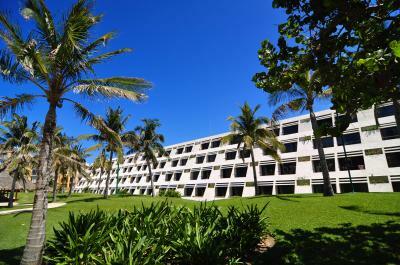 This hotel features a convention centre and outdoor areas for events and social activities. It features 5 restaurants, snack bar, a modern sports bar, an ice-cream parlour and a cigar bar. For an additional cost, guests may use the meeting rooms, the golf course, wedding planning, spa and beauty salon, babysitting service, laundry service, 24-hour Internet access and medical service. In addition to a lobby with lift access, further facilities include a hairdressing salon and kids&#039; club. The Hotel is located just 15 minutes from the International Airport and is within easy reach of the main attractions of the area; Spas, archeological sites, shops, restaurants etc. There is a variety of activities to enjoy such as visits to the Maya ruins, swimming with dolphins, feeding sharks, or to play a round of golf. The Iberostar Cancun offers many activities for all the family. There are bars, discotheques, fabulous swimming pools and night entertainment with live music for teenagers, there is the Club de Lucy for children where they can play games during the day, not forgetting the white fine sandy beach and crystal waters where you can relax and enjoy yourself. There are 426 magnificent rooms, with an elegant decoration which combines to perfection to the natural surroundings of the region. There are 224 rooms with sea views; 99 rooms with sea view and balcony; 28 villas opposite the sea with balcony, 54 villas with views of the garden with balcony, 16 Junior Suites, 4 Master suites and 1 Presidential Suite. In all rooms there is internet connection ( with cost), 3 telephones with message box, air conditioning, alarm clock with CD player and MP3, safety deposit box, mini bar, hair dryer and 32” flat screen TV. Muy buena atención por parte del staff. Hemos pasado unos días fantásticos en familia. El complejo está bien mantenido. Las habitaciones amplias pero mobiliario se ve algo viejo. Fuimos en familia con mis hijos y hay opciones para que toda la familia pueda disfrutar. Muy buen complejo hotelero una muy buena elección. La comida buena el servicio excelente así como la animación del hotel por la noche y durante el día. Servicio muy atento. Excelentes instalaciones y calidad del servicio.